"Smart, warm, uplifting, the story of an out-of-the-ordinary heroine whose deadpan weirdness and unconscious wit make for an irresistible journey as she realizes the only way to survive is to open her heart. Meet Eleanor Oliphant: she struggles with appropriate social skills and tends to say exactly what she's thinking. That, combined with her unusual appearance (scarred cheek, tendency to wear the same clothes year in, year out), means that Eleanor has become a creature of habit (to say the least) and a bit of a loner. Nothing is missing in her carefully timetabled life of avoiding social interactions, where weekends are punctuated by frozen pizza, vodka, and phone chats with Mummy. But everything changes when Eleanor meets Raymond, the bumbling and deeply unhygienic IT guy from her office. When she and Raymond together save Sammy, an elderly gentleman who has fallen on the sidewalk, the three become the kind of friends who rescue each other from the lives of isolation they have each been living. And it is Raymond's big heart that will ultimately help Eleanor find the way to repair her own profoundly damaged one"-- Provided by publisher. Dysfunction & Isolation in the UK submitted by sdunav on June 18, 2017, 2:10pm This is an interesting novel set in Great Britain, featuring an awkward woman who is disconnected from those around her. She is gradually drawn into relationships by the IT guy (of all people!) and an older man who collapses on the street near her workplace, and the reader learns more and more about her family history as the story progresses. It reminded me of "A Man Called Ove" in some ways, but with a much a darker backstory. Not sure I liked the ending but it was a good read overall. Promising story submitted by dicencal on June 26, 2017, 8:58am This is an absorbing story about a lonely woman who had a very difficult childhood. The best part of the book is the narrator's voice, which feels very real. The author sets up some unrealistic scenarios (including the ending) that I think take away from the powerful story about loneliness that she is telling, but it is overall a good read. Could not get into this book submitted by bookher on June 28, 2018, 1:13pm I have tried twice now to read this book because I normally love oddball romance stories but I think it's because I can't stand this woman who is the protagonist. She annoyed me so much that I really didn't care if she found love. I realize this isn't a good reason to say a book is bad but I just couldn't waste any more time being annoyed with her. Great Book submitted by Lucy S on July 2, 2018, 11:51am Gail Honeymoon has created in Eleanor Oliphant one of the most endearing, strange, heartfelt, humorous and lonely characters I can recall meeting in recent literature. I was amazed by how effectively Honeymoon was able to convey a story both funny and terrifyingly dark at the same time. Stunning. Grim topic, but excellent writing and a story full of beauty and hope submitted by 21621031390949 on July 19, 2018, 11:26pm Really good book about an adult who survived a vicious childhood, her constricted life resulting from the trauma, and her ultimate redemption. It sounds like a grim book, but it's not; there is much beauty, grace,and hope to be found in its pages. The writing is top notch, the characterizations deep and real. Highly recommend. 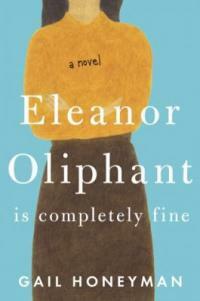 You will fall in love with Eleanor Oliphant! submitted by lemmer on July 20, 2018, 10:12am This book was amazing! The characters are really well developed and you can't help but feel sorry for Eleanor and root for her, at the same time. She literally made me laugh out loud, many times. I love that her past is revealed to you, slowly, in bits and pieces. It is definitely a page-turner, with a big reveal in the last two pages of the book! Can't stop recommending this book to my friends. Description: 327 pages ; 24 cm.